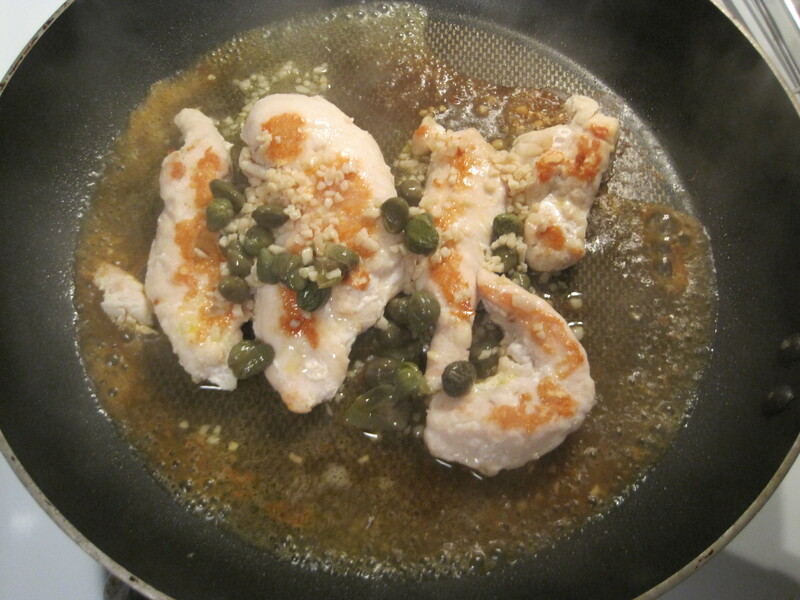 Since we recently talked chicken, I thought it would be appropriate to share one of my favorite chicken dishes of all time: Chicken Piccata. Chicken Piccata is one of my favorite dishes, but I only allow myself to eat the indulgent, less calorie-friendly version every so often (keep an eye out for that version, coming soon!). So I developed a way to incorporate a super healthy version (but still extremely tasty) into my weeknight repertoire. 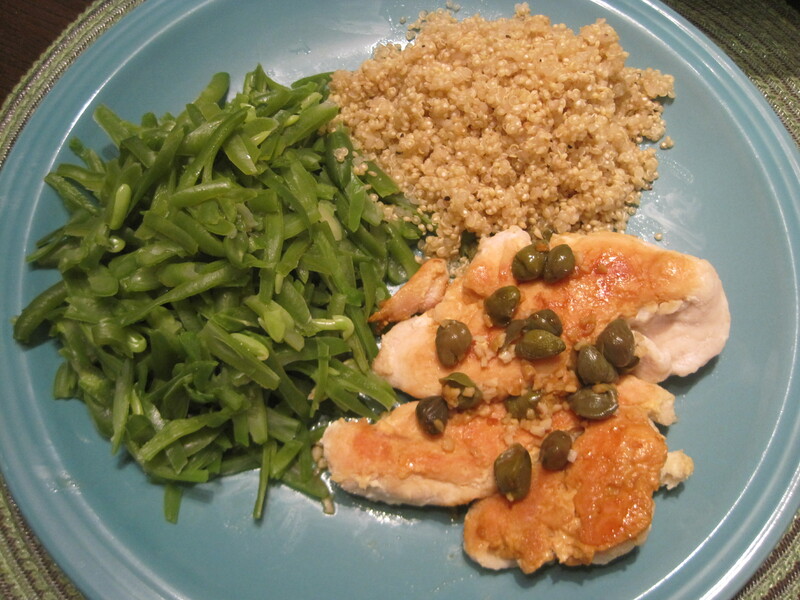 It incorporates mostly kitchen staples, with capers thrown in as the twist. Note, capers can last in the fridge for a really long time, and trust me, you’ll want to make this dish often! 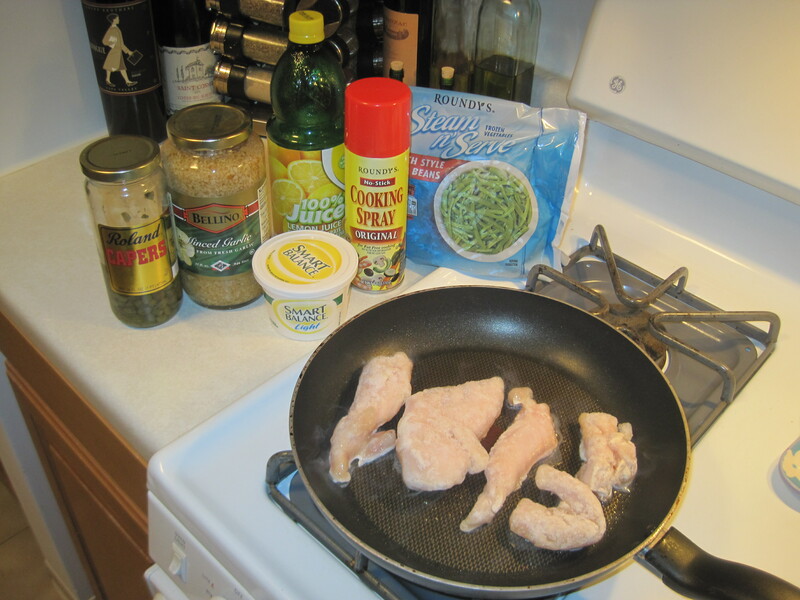 All the necessary ingredients for Chicken Piccata - that's it! The chicken is in the pan, ready to go. Spray your very large pan with cooking spray (not your grill pan this time, because we’ll really want to soak up the juices), and turn the heat up to medium. 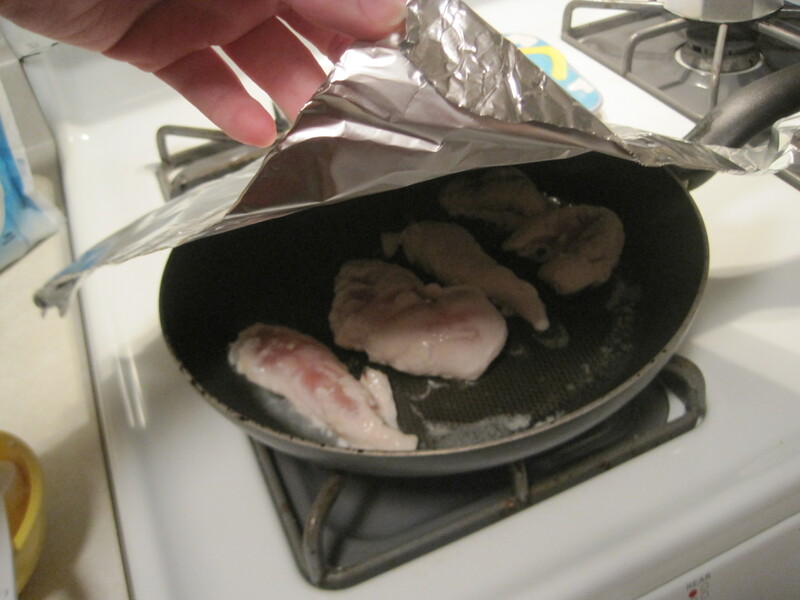 After it’s heated up, add your chicken tenders to the pan and cover with aluminum foil. Cook for about 8 minutes, then turn and recover for another 6 minutes. Mmm... chicken is looking pretty good under there! It looks like it's almost ready to flip. While the chicken is cooking, put your margarine and garlic in a small, microwave safe bowl (a cereal bowl works just fine if you don’t have anything else). Heat the margarine-garlic mixture on high for 30 seconds in the microwave, then add the lemon juice and capers and let it sit. When the chicken is looking a delicious golden-brown color after the 6 minutes of cook time, pour the margarine-lemon-garlic-caper mixture over the top for the last 2 minutes of cook time, and cook uncovered. The chicken is done, and the piccata sauce is added. Turn off the heat, transfer to your plate, and immediately enjoy a healthy version of chicken piccata any night of the week! The finished product - Healthy, Yummy Chicken Piccata. Tonight, I served it with steamable green beans drizzled with lemon and a lemon quinoa. **Keep in mind, the best time to make your grain is right before you put the chicken in the pan. Get that rice in the rice cooker or the quinoa cooking on the stove. Tip: if you’re making quinoa, add lemon juice to it after it’s done cooking to bring all the flavors of the dish together. My favorite veggies with this are green beans (topped with a little lemon juice) or a bed of arugula (topped with a little lemon juice, olive oil, and Parmesan cheese – 1tsp each). Chicken is one of the most versatile proteins to make on a weeknight. After years of nailing down the simplest way to do it when you really don’t feel like cooking, I developed a few ideas of how to make it easy, healthy, and inexpensive. So before I get into my go-to chicken recipe, let me give you my chicken philosophy. First, let’s discuss fresh vs. frozen. Fresh is great. It’s going to give you great flavor and texture, but let’s face it, I always get nervous about fresh chicken going bad. So if I ever buy it at the market (which I sometimes do), I keep it in the fridge for about 3 days before deciding to use it or freezing it. If I feel like chicken in those three days since I bought it, then great! If not, throw it in the freezer so you can have it whenever you want it. So let’s face it, most of the chicken I use is frozen. Because of that, instead of buying fresh chicken, I actually just buy bags of frozen chicken instead. My #1 tip about defrosting: DO NOT defrost in the microwave. More times than not, you’re going to end up cooking part of the chicken when you do that, and you end up with tough chicken. Tip #2: I stay away from taking the chicken out of the freezer and putting it in the fridge in the morning. I can’t tell you how many times I’ve found the middle of the chicken still frozen. Not to mention, sometimes after doing all that work in the morning, I really don’t want chicken when I get home! So waiting until you get home to decide whether you want chicken for dinner gives you more flexibility in planning your meals. How I always defrost chicken is my tip #3: Put the frozen chicken in a bowl and run hot water over it from your sink. Fill the bowl with water (enough to cover the chicken), and constantly change out the water with fresh, hot water until the chicken is defrosted. This won’t cook the chicken, and it only takes about 20 minutes. So what I do is get my grain cooking (usually rice in the rice cooker), then get the chicken defrosting, and go relax while I wait. That being said, I don’t always defrost my chicken before I cook it. Yep, that’s right. To even cut out the 20 minute defrosting process, I often cook my chicken from frozen. I’ve found that this also keeps my chicken nice and juicy in the center. So I only defrost my chicken if I’m going to stuff it, which is rare, but I’m sure you’ll find a few recipes in my blog at some point! Frozen chicken tenders are my savior, which is why I made them a Kitchen Staple. When I get home from a long, grueling day at work, I want to do the most minimal work possible, and these are the best to cook from frozen. So, on to my go-to chicken recipe, Lemon Chicken. Get your grill pan (or very large pan) heated up over medium heat, and spray with cooking spray. Put as many frozen chicken tenders as you’d like on the pan (I usually eat 2-3, Clinton usually eats 4-5), and then cover the pan with tinfoil. Cook for about 8 minutes, covered over medium heat, and then turn and recover. After about 5 minutes, pour in the lemon juice and sherry, and then recover and cook for about 3 minutes. This takes the gamey flavor out of the chicken, and leaves it tasting fresh and delicious. Your chicken should be looking pretty good by this point. After it’s a nice golden-brown on both sides, take off the foil to let the lemon-sherry sauce cook down for a couple minutes, and then season with the lemon pepper. All in all, the chicken takes about 20 minutes to cook. This is the perfect amount of time to also cook rice (white or brown) or quinoa for a grain. And with about 5 minutes left in the cooking process (so after you added the lemon and sherry), stick a bag of frozen, steamable veggies in the microwave. This is a great, easy dinner to have on any weekday night. And since each chicken tender is only about 100 calories, it’s a healthy one to boot! For those of you who are afraid of tofu, this dish will change your mind. Tofu can work a lot like chicken because it soaks up the flavors it’s cooked with. The trick is to use extra-firm tofu, so the texture will remind you of any type of protein. Not to mention, tofu is pretty inexpensive and can last in your fridge for a long time. This dish in particular is one I discovered in grad school. I was living in bitter, cold Chicago, and living on a grad student budget. This is a warm, comforting dish that’s really inexpensive to make, not to mention it’s super healthy! After trying it out on myself and falling in love with it’s rich deliciousness, I made it for a few of my girlfriends, all of whom had been tofu skeptics. But they loved it! So I thought it would be a great way to change your minds about a different type of protein, too. I use a whole block of tofu in this recipe so that nothing goes to waste (it makes about 4 servings). It’s so easy, and it makes great leftovers if you’re cooking for only one or two. But as a dinner for my three girlfriends and me, it was a perfect winter meal. So here goes! First, get the rice cooking. Get it all set in your rice cooker, and then go relax for about 10 minutes (watch TV, read a book, browse the Internet, whatever). The tofu doesn’t take very long to cook, so this one gives you some rest time. After relaxing for a bit, heat the olive oil in your “very large pan” over high heat. While it’s heating up, place the tofu on a cutting board and slice into small cubes (about 1/2 inch cubes work best). After the tofu is sliced, dump the cubes in the olive oil to fry. Optional middle step: defrost the package of frozen spinach in the microwave. I usually put it in a glass bowl, run water from my faucet over it for about 1 second (to be about 2 tbsp), and then follow the microwave instructions on the package. Usually, you heat it on high for 3 minutes, stir, and then heat again. It takes about as long to defrost the spinach as it does to cook the tofu, so after you get the tofu in the pan get that spinach defrosting! While the tofu (and possibly spinach) is cooking, make the sauce. To do this, whisk all the sauce ingredients together (water, peanut butter, vinegar, soy sauce, honey, ginger, and garlic). Set aside. Continue to monitor the tofu and stir around in the pan to get all sides of the cubes nice and golden-brown. This doesn’t have to be exact, but as long as you have most of the sides golden-brown you’ll be good to go. After the tofu is golden brown-brown (about 5-7 minutes, and don’t wait for the spinach or sauce to be done or it’ll burn! ), lower the heat to medium and stir in the peanut-ginger sauce. Continue to stir the peanut-ginger sauce in with the tofu for about a minute, or until it thickens up. Then add the spinach and toss with the tofu. Scoop out about a cup of cooked white rice and pour the peanut-ginger tofu on the top, and then enjoy! It’s a nice healthy, hearty meal that can also be deliciously reheated for lunch (or dinner) the next day. Each serving of the peanut-ginger tofu is only about 220 calories. The first blog post is always the most intimidating, so I’ll start with how to navigate through the blog. I really encourage you to check out my pages: “About” really gives my food philosophy, “Kitchen Staples” are what you should stock your kitchen with before we really get going, and “Gadgets and Tools” are what I think are essential to making the magic happen every night of the week. Please note that most of my recipes are meant for two people, so expand or detract as necessary! Additionally, I’ll add tags to each of my posts, making it easier to find what kind of food you’re in the mood to make each night. For example, I’ll denote the type of food. I’ll also let you know whether it’s a whole meal or a component of a meal – sometimes I’ll just give you the main course, and you can fill in the blanks for side dishes, and other times I’ll give you a whole meal idea. I’ll let you know about the level of fanciness (in other words, there might be extra ingredients you would need). I’ll try to break down if the meal is super low-calorie healthy or whether it’s more of an indulgence. And lastly, I’ll mark about how long the recipe or meal takes to make. Above all, please use this as inspiration. Adding your own twists is the most exciting part to any recipe idea! For example, I tend to shy away from super spicy food, but if you love it, add some extra cayenne or sriracha to make it work for you! Have fun, enjoy, and remember that cooking every night can really be easy, healthy, and inexpensive – from my humble kitchen to yours.